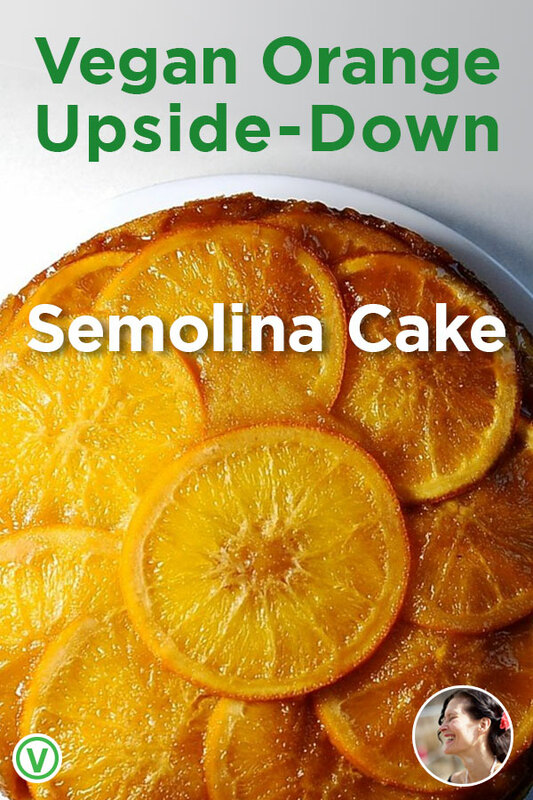 Who doesn’t love the look of an upside-down cake? 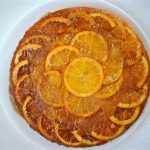 This semolina cake has that unique semolina mouth feel that entertains your tongue while all three permutations of citrus sparkle on your taste buds. Inspired by the ambrosial slices of revani (greek semolina cake) found in tavernas across Greece. As a little girl I remember sitting down on a lemon blossom night to a slice so generous it was seemingly cut from the moon itself. 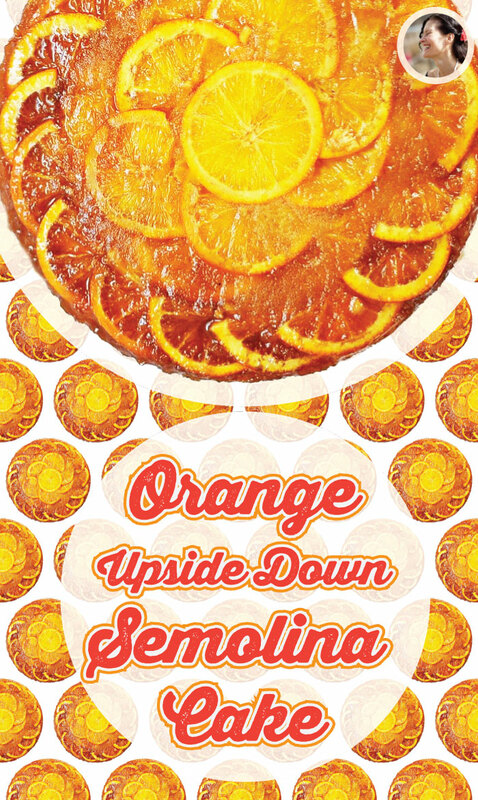 Each rich forkful a play between burnt sugar, orange marmalade, and soothing vanilla. The first time we rode the train from Athens to Denmark my mother sat us (her daughters) primly, properly, oh so Danishly on either side of her on the bench, in the railway compartment. As the train pulled from the station a sound arose like the flapping of wings, the rustling of grasses, it was the greek matrons unwrapping a feast of wax paper swaddled food. While our mother had carefully packed enough dry sandwiches to last us the journey, these grecian goddesses unpacked a bounty from their hand woven baskets. Whole mahogany chickens emerged, roasted lemony potatoes, oranges and watermelon materialized. Loaf upon loaf of fresh bread was torn or sliced and passed around. Visitors came and went from the other compartments sharing food and laughter. The train had become a village, a home and we as foreigners were their guests. They insisted we share in their well laid table. Like the never ending silk scarves of a magician, no sooner had one course been cleared then another appeared, cakes, pastries, fruits, all was shared. Coffee and tea could be bought from your window at train stations and drunk while the train was at the platform. 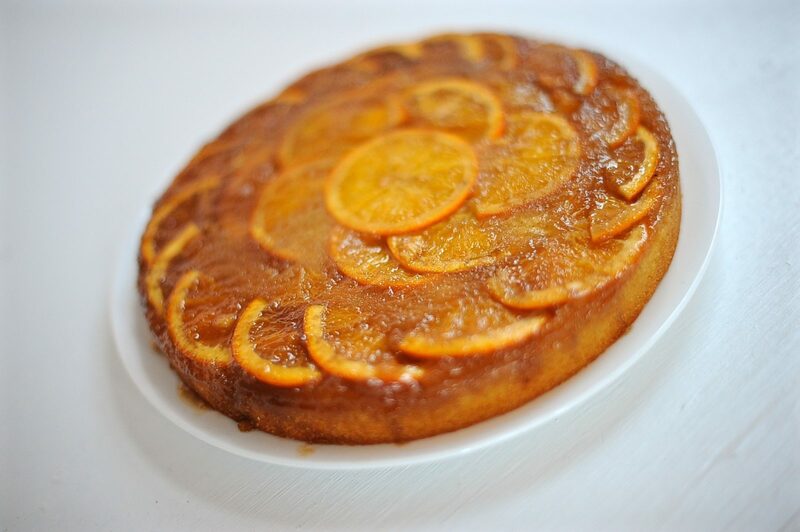 A moist Orange Semolina Upside-down Cake that will have your friends swooning with each orangey bite. Oil a 9 inch springform pan and heat your oven to 350 degrees fahrenheit. Slice your oranges into thin half rounds or full circles. 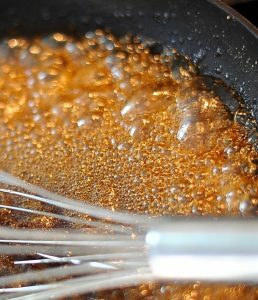 Place brown, white sugar, orange liquor, and pomegranate molasses into a medium sauce pan over medium heat. Bring to a simmer. After simmering for 4-5 minutes add the butter and stir until incorporated. Remove from heat and stir in the orange blossom water. Pour the caramel mixture evenly onto the bottom on the prepared pan. 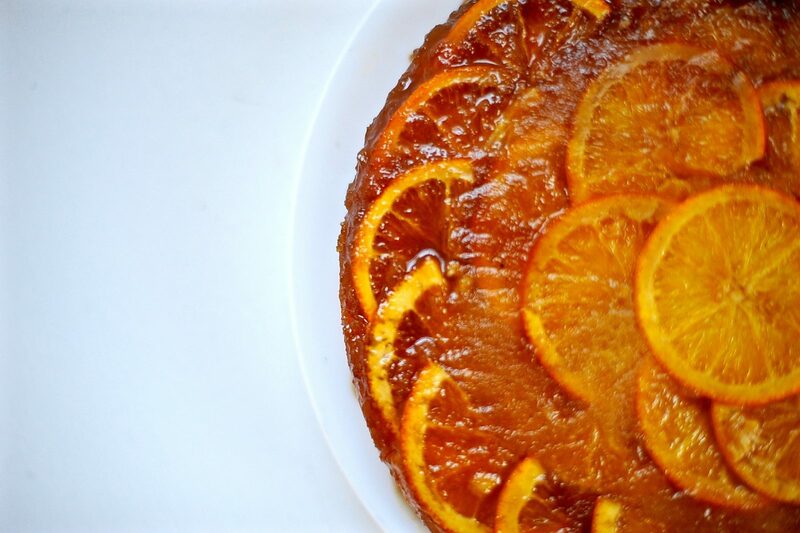 Arrange thinly sliced oranges in a pleasing concentric pattern at the bottom of the pan. (You'll not there are two differently patterned cakes photographed for this post. Whisk semolina, sugar, baking powder, orange zest, cardamom, and salt in a medium bowl. Whisk yogurt, orange juice concentrate, vanilla and aquafaba together into a large bowl. I just whisk in the orange concentrate frozen cause it melts and incorporates quite easily. Pour the wet ingredients into the dry ingredients. Stir until fully incorporated. Now stir in the melted butter. Pour the batter over the sliced oranges into the prepared pan. Bake 55–65 minutes until set. Cool in pan 10 minutes. Place a plate over top of pan, unlatch the springform hook, say a prayer cake and flip. This cake keeps marvelously well tightly wrapped and placed in the fridge. I've kept it up t three days in the fridge and when I unwrapped it it was as moist as the day I made it. Jeweled citrus gleaming on a soft bed of semolina. Perfect with smokey caravan tea or a strong small coffee. One bite makes you feel like you’re sitting on mounds of colorful embroidered pillows on the floor of a sheik’s palace. A whole slice makes you feel as though you are the sheik yourself. Swoon. Save few crumbs for your camel. Aylam photo that means a great deal coming from you. This my dear makes yesterday’s lemon drizzle that I made seem so very irrelevant. Love your writing style; I was there with you in the train compartment. Oh you Brits with your fanciful dessert names. 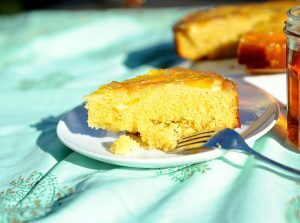 Lemon Drizzle. I googled it and now me wants a slice. Or two. Thank you babe. Your recipes unfold like epic films before me. Oh you! Love you. and your little Peanut too. 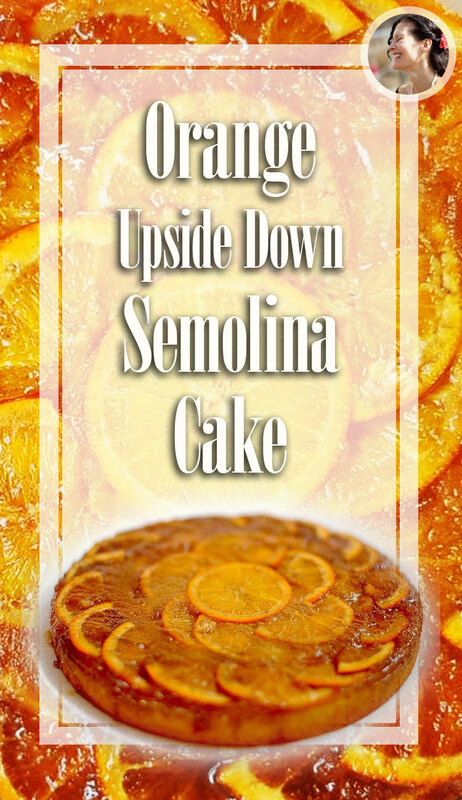 An eye-popping cake that reclaims the color orange! I’d love to try to make this for my in-laws when they visit next month. What can I substitute for pomegranate molasses? In the cake part of the recipe, I can use vegan margerine for butter, right? How do I know if the aquafaba is reduced enough? The pomegranate molasses just adds a sour-sweet touch to the caramel. It is pretty minor. You could add the same amount of any not too sweet jam. Like raspberry or cherry. You want to reduce the aquafaba from a can by say 25%. It will have a slightly gelatinous tacky texture like raw egg whites but slightly thinner. Vegan margarine is a fine substitution. Good luck!! Thanks! One more newbie question: what kinds of canned beans have the best aquafaba? (I’m enamored of that word: it sounds like the name of a mad Roman emperor.) I’ll make two of these cakes at the same time: one to serve and eat and one to shellac and hang up on the wall (in lieu of the sun). I prefer chickpeas. Deciding on a pattern is so much fun. Leigh is making hers with grapefruit for a pale design, I’ve made it with blood orange, navel and some small tangerine like citrus. All Hail! Aquafaba! Oooh, those variations must look amazing. What about kumquats (as if I could ever find them where I live)? If I could use the words “kumquat” and “aquafaba” in the same sentence (other than this one!) I would be really chuffed. Just to bring things back down to Earth … I appreciate the Durrell quotation in this post. My Family and Other Animals was one of the books we used to read aloud from at dinner (see comments to the previous post), as you remember. I tried to read passages of My Family and Other Animals aloud to your niece a while back but I was laughing so hard I couldn’t get the words out and the tears were streaming. I think that more than anything else I was remembering how funny it was when we first read it, at the old kitchen table. Your niece and your brother-in-law thought I was off my rocker. Which I was. Luscious photos and descriptions that make me salivate!!!! Excuse me while I go shopping. Keep your stories, recipes and photos coming please. You warm my heart. When you mentioned Gerald Durrell I was smitten, but when you mentioned Greek mythology, I was completely bowled over! I love your style of writing! Could almost smell the food being unwrapped in the train carriage! Radhika, You have no idea how much that means. I will keep that complement in my purse for those moments when I need it. 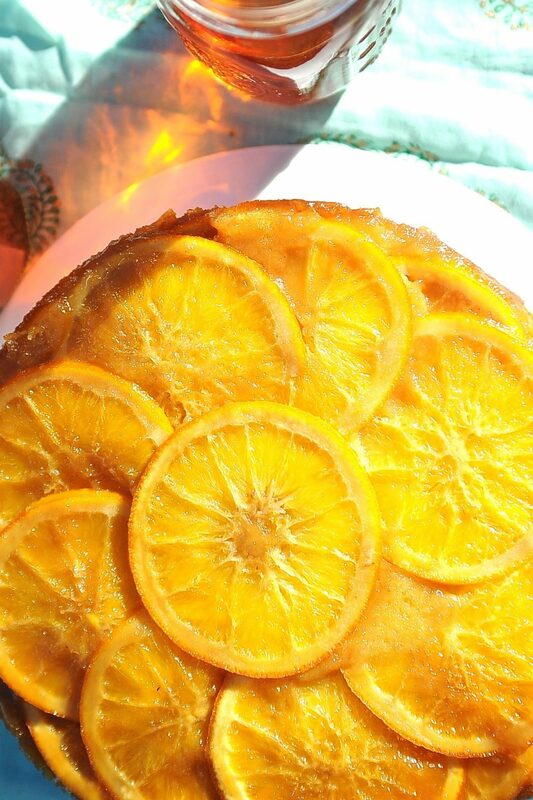 This is the cake version of a sunny lazy day. Sweet, sticky and delicous. Only improved by having hair crunchy with salt water. It worked great! I used 3/4 cup cornmeal and 3/4 cup AP flour. Cake was delicious and it has a good “wow” factor. Will definitely make it again. Thanks for sharing! 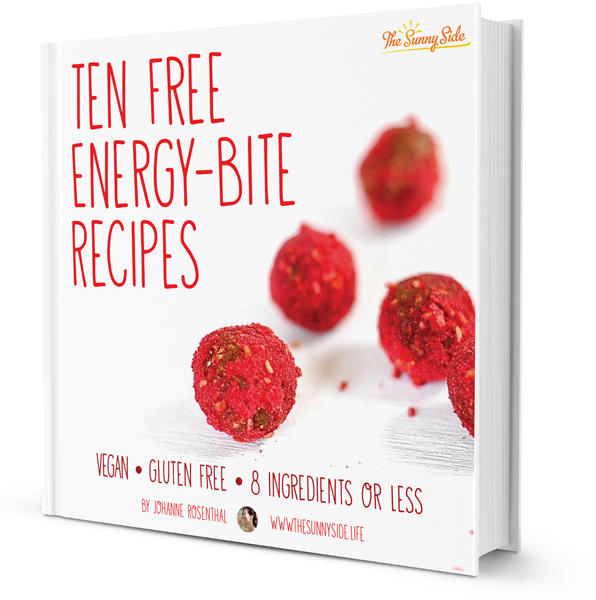 Thank you for this inspiring recipe! I made this recently for my 43rd birthday. I treated myself to some new ingredients I had never used before – namely the semolina flour plus the pomegranate molasses and orange blossom water which I purchased from Amazon as a lovely flavor trio that also included rosewater! 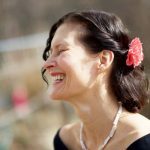 I am delighted to have since learned new ways to use those items from facial toners to culinary and mixology uses! The cakes (I made two) turned out excellent! This was the first time using aquafaba (I also joined the Facebook group you suggested!). I started out by reducing canned garbanzo bean aquafaba and cooking it only to find it was THINNER. I proceeded to open a new can and used the aquafaba straight from the can which worked out perfectly for the cakes. 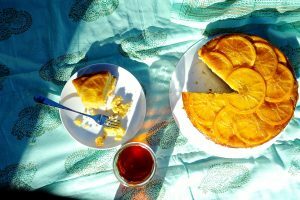 I will make this recipe again! Thank you! I literally did a little happy dance when i read this comment. Happy Birthday! I’m glad I had a small part it your special day. It is wonderful to discover new ingredients. Pomegranate molasses is delicious in salad dressing, marinades and soups as well.